^ 1.0 1.1 Liptak, Adam. Antonin Scalia, Justice on the Supreme Court, dies at 79. New York Times. 2016-02-13 [2016-02-14]. 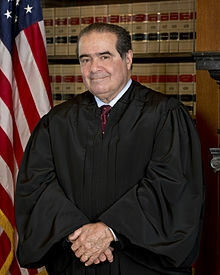 ^ 2.0 2.1 Savage, David G. Supreme Court Justice Antonin Scalia dies at 79; fiery conservative fought liberalism's tide. Los Angeles TImes. 2016-02-13 [2016-02-14]. ^ Antonin Scalia, conservative US Supreme Court justice, dies. BBC. 2016-02-14 [2016-02-14].